Image by Robert McLeod, Copyright 2014 Mutianyu Schoolhouse Restaurant Company, Ltd.
On a clear day, biking around Beijing is a scenic and efficient way to see the city. Most hotels include free bike rentals in their room rates. Grab-and-go bikes are also available on the street simply by downloading an app. Once on two wheels, it's easy to explore the narrow hutongs, or alleyways, where new outfits like Great Leap Brewing and FIX coffee house put a twist on tradition. The Forbidden City (also known as the Palace Museum), is a must-see. After a day of exploring, you'll have earned a few Peking duck pancakes -- try Da Dong Roast Duck (5/F, Jinbaohui Shopping Center, 88 Jinbao Jie, Dongcheng District). Celebrating a deal? Jing Yaa Tang provides designer surrounds and tableside carved duck in the basement of The Opposite House hotel. An excursion to the Great Wall is another must. 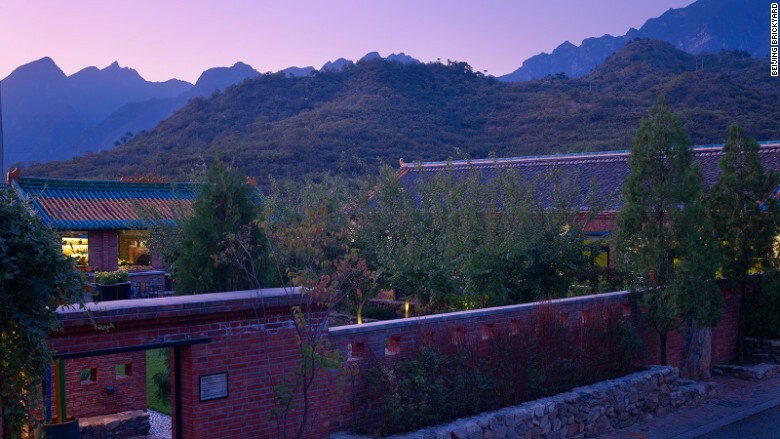 Boutique hotel Brickyard provides a stylish and comfortable place to stay when hiking the Wall's lesser-frequented Ming Dynasty-era sections of Jiankou or Simatai.